TONY Abbott has leapt on a declaration by Tim Flannery – Julia Gillard’s hand-picked salesman for action on climate change – that emissions abatement is a 1000-year proposition to renew his attacks on Labor’s proposed carbon tax. And Climate Change Minister Greg Combet has distanced himself from Professor Flannery’s concession last week that even if all carbon emissions stopped today, it would take 1000 years for the atmosphere’s average temperatures to drop. While Professor Flannery, a paleontologist who is also the Prime Minister’s chief climate change commissioner, has expanded on his comments to insist the need for action in climate is urgent, his admission in a radio interview on Friday has compromised Labor’s sales pitch on its carbon tax. In a letter to the editor of The Australian, submitted on Sunday, he expanded on the comments, saying his observation was not “an argument for complacency”. But yesterday, as the role of the carbon tax in Labor’s massive loss in the NSW election dominated federal political exchanges, Mr Abbott quoted Professor Flannery as he ridiculed the tax as “the ultimate millenium bug”. Gee, the sheer power of that argument has convinced me, Greg. But you have to feel a bit sorry for poor old Greg and Julia, they brought Flannery in as Climate Commissioner because they thought he’d give them what they wanted, and already he’s become an embarrassment. Oops. Sometimes you have to act, regardless of whether your own “experts” say it will actually achieve anything*.. because then you attain a warm fuzzy feeling since you “believe” in it. The real question that needs to be asked is – why is Flannery the advisor? The AGW question is a matter for a statistician, not a paleontologist. Also, as Steve McIntyre et al have able demonstrated, when the AGW theory is subject to proper statistical scrutiny it falls apart rapidly. Tim Flannery didn’t say that making cuts to emissions wouldn’t have any effect. Don’t be [snip] stupid. If we don’t cut emissions, the temperature will keep going up and up and up. If we do cut emissions, the temperature will stay the same. Which part of this don’t you understand? Cutting emissions in Australia won’t make any difference to the temperature whether today or in a thousand years. Which part of this don’t you understand? And offensive language will get you permanently banned. Alarmists contend that current temps and CO2 levels are too high right now, or have you missed all the “extreme” weather (amongst other effects attributed to AGW) hysteria? True, cbp. But by how much? The effect of adding CO2 is logarithmic. That is, additional CO2 has a diminishing effect on temperature. So, using the Flannery formula, if the planet doubled its emissions, the increase in temperature will be less than sod all in 1,000 years. Well,you are right about one thing cbp Flannery talked alot but did’nt say much of anything really and,1000 years are you serious.The govt and their appointed mouth pieces must think that evolution has started to reverse and then your re-working of what he did’nt say a really nice try but sorry no cigar my slow friend. Now I am worried. Flannery has never been correct about any weather related thing before, why is he now credible? 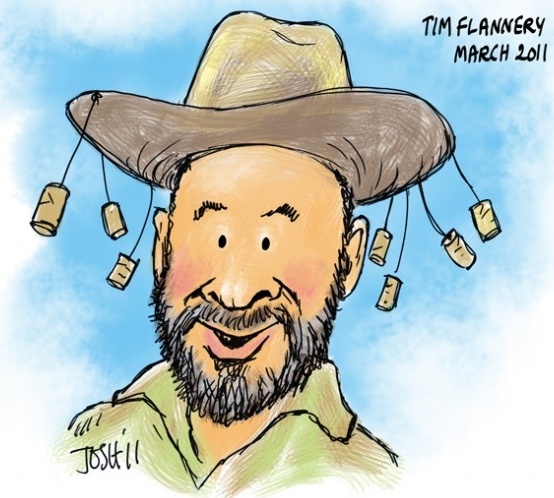 It’s not that Tim Flannery is now ‘credible’ … it’s the fact that he has always been so (in)credible with his alarmist views. Tim Foolery and the Great Guano. Another two success stories from this profoundly incompetent train wreck of a government. At the first Climate Change Commission Forum in Geelong not only Flannery stated this but the IPCC’s hero Will Stephan [Steffen – Ed] also supported his comments with similar comments! Yeah – well – don’t get excited by this. Steffen is doing nothing more than mounting the case for 1,000 years of grants to study the problem. Andrew Bolt recently correctly said that Flannery is the right man for the job because he is a good demonstration of just how little “we” know about climate. Thank you, Tim. Unfortunately the argument omits what happens if we remain inactive, and the global temperature rises by 4 degrees or more. Come now, the science is clear, and we all need to work together on this. Please find a way to deal with the difficulty of this truth. The science most certainly is not clear. The rise of 4 degrees that you quote is nothing more than the projection of incomplete computer models which incorporate strong positive climate feedbacks. There is nothing in the empirical observations to show climate sensitivity anywhere near this figure in the real world. The absorption band of CO2 is virtually saturated, with less than 1 degree of warming forecast for a full doubling of atmospheric CO2 concentration from today’s levels. Anything beyond that is purely the product of computer models. That said, even if we accept your statement as true (which I do not), nothing Australia does unilaterally will make the slightest difference to global or local climate. China and India will continue to grow their emissions over the next decades, and crippling our economy to make a barely noticeable change in CO2 concentration spectacularly fails the cost/benefit analysis I’m afraid. What reason do you have to dismiss computer models, especially when similar models have held up so well from the past when models were less sophisticated? What do you make of the rebuttal of the saturated-CO2 idea that is summarised on skepticalscience.com? Have you factored in China and India’s inclusion of cost-of-living catch-up into the equation? If not, how do you account for Australia’s acting in an ethical and just way on a per-capita basis? Why are the views you are indirectly citing so overwhelmingly under-represented in the peer-reviewed literature? Is that not a concern to you that perhaps such views may be scientifically marginal and lacking in robustness? I am only going to respond to the first and last points (and this is my last response – I have other priorities on my time). There is no evidence that climate models have “held up so well from the past”. Weather forecasting models work reasonably well, but they are very different from climate models projecting hundreds of years into the future. Climate models have failed to predict the slowing of warming since about 2001, despite increasing CO2. They are necessarily very, very rough approximations of the dynamics of the climate system. On your last point, I don’t care the slightest bit that these views are “under-represented” as you put it. Science isn’t about counting heads – just research the helicobacter pylori story to see that. I’m not here to persuade you to think differently about these issues. You can believe what you like. If you choose to believe everything that’s written on skepticalscience.com (which should really be called un-skeptcialscience, by the way), that’s your choice. I agree that science is not a numbers game, but it definitely is an evidence game, and the overwhelming, mountainous evidence is clearly pointing in the direction of human-induced global warming. The evidence in the peer-reviewed scientific literature does not support your claim that warming (on a global scale) has slowed since 2001 – quite the reverse in fact (perhaps you’re not including the most important component, the oceans). The evidence is also very strong indeed that computer models are reliable, and increasingly so (eg. Hansen’s 1988 and 2006 papers). True scepticism examines the evidence and is prepared to change views. This site does not represent scepticism, but only contrariness, despite massive evidence. What is unskeptical about skepticalscience.com? All the site is doing is citing the peer-reviewed literature. Perhaps you would benefit by doing more of this. In the meantime, we are rapidly running out of time. As a father, I cannot stand idly by while we endanger my daughter’s future. Can you risk your children’s survival and safety on such flimsy grounds? See ya – I also have more important work to do. LOL Rob at your pompous and sanctimonious tone… as if we don’t care for our children either. Give me a break. Now go away back to Skeptical Science. It’s not sanctimonious – it’s deadly serious. It’s foolish to try and laugh this off and criticise those who take the mounting evidence seriously. If you care about your children, don’t risk their future. If you care about your children, don’t risk their future. Heh heh heh….that’s a pretty patronising statement don’t you think Doc? Do you take us for fools? But as you have raised it let me say this; it’s specifically because we do care for our children that we are fighting against this UTTER madness. You actually presume a few humans can control the climate of planet earth by increased taxes? It’s clear you’re a “true believer” so I won’t waste my or your time by trying to undermine your faith with reason. That would just be a pointless exercise wouldn’t it? No, I don’t take you for fools. I take you for people in denial, perhaps unable to face up to the unpleasant emotions that may come with accepting the hard truth. And it is indeed the truth – it’s not faith, it’s simple, plain evidence. No belief is required – only an unbiased examination of the science. Since the consequences are serious, I think it is a grave moral issue, however, to wilfully remain ignorant, and especially to remain inactive. I don’t agree at all that this is a patronising attitude – I rather think that I’m just standing up for what’s right and holding you to account for sloppy thinking that is contributing further to the biggest problem humanity has ever faced, both practically and morally. We all need to work together to address this. It’s much more serious than World War Two – don’t continue to be like Lord Haw Haw or Chamberlain. I thought you said “Bye for good” earlier? I did say “bye for good” but then people kept making responses. This is the last one I’ll reply to. Have fun. How about if we all take 2 aspirins and call you in the morning a thousand years Doctor? The dear Doctor, in his last gasp thread, betrayed himself ! Like members of the ‘Get Up’ crowd, he too is intolerant of contrary views and arrogantly claims his PhD to be more learned than those in the Medical Profession. I confess to a smile when reading of his concern for his daughter’s future. Thankfully, she & multiple generations of her progeny, according to Flummery (sic), will be spared the agonising death from excessive CO2 inhalation. That he isn’t a Doctor of Medicine comforts me. Patients have been spared! That he is of the ‘boffin’ variety with a Green streak like that other Doctor from Tasmania, beggars belief & he be well advised not to boast about it !. Earth to Tectonic shift – there was a smiley (but seriously, “doctors” don’t earn PhDs, so I’m not sure why we call them “doctors”). Is there insecurity hiding behind your disdain of higher learning? Why do you assume I’m a medico? For the purposes of the gag I thought it was an appropriate assumption. Don’t blame you for asking and glad you did. At least the response taught us about the person behind the Title ! The best solution to climate change is to help the poor of the earth become weathly, so they can cope with climate change. Denying them the benefits of industrialization is cruel on a massive scale. China and India are just the start. There are 1.5 billion more people living in the world without the benefits of electricity. They all want the benefits of industrialization that we have. The poor of the world cannot industrialize by cutting down trees, any more than we could. They cannot afford expensive solar panels and advanced wind-mills. They need and deserve to use the same low cost solution we did to industrialize. Coal. It is cheap, it is abundant, it uses proven, simple technology. It is the only way that the poor nations of the earth are going to get themselves out of poverty. It is how we did it. Coal still produces most ofthe power even in industrialized countries. A tax on CO2 in Australia will not make any difference to global CO2. China, India, and the developing world will drive that going froward. Australia with 20 million people is a fly speck. The tax will however make Australia poorer, so that it is less able to deal with climate change, and less able to help poor countries develop their own ability to cope with climate change. Anyone believing the Governmen’ts action is meritorious & will have Australia contribute significantly to reducing Man Made Global Warming has to be completely deluded. Just as deluded as the agenda driven Scientists who advocate CO2 is emitted in dangerous quantities and will bring catastrophic consequences. Spread misinformation & lies long enough & you will recruit believers ! Just mention a scheme involving money & it’s not long before the dealers & wheelers are at the trough. Not everybody is a fool. Thoughtful people would willingly embrace any logic based sheme or program, providing the details were fully explained and some guarantee for their investment is given. In this debate (debacle) however, no explanations are given. Reliance has been placed entirely on Scientific modelling, using thermometers from 1860 & tree rings before that ! They have not categorically proven the hypothesis that the globe is warming. It is no more than their collective opinions. Forget about the numerous eminent Scientists who dared to contest these conclusions. Those learned men, like Gallileo, are branded heretics. As for guarantees of return on investment, the best we have so far is the incredible admission by Prof. Flannery that even if the entire world began reducing emissions today, it would take up to 1,000 years for any change to be noticed. I’m prepared to accept Flannery’s postulation and so does every skeptic. Problem is, his admission has even embarrased the Govt. & sections of the Media who have gone silent & will not pursue him, in the national interest. Do we need a TAX as a panacea to all this ? That is a defeatists means to an end. Has man not demonstrated over time that he is a creative & resourceful creature ? Would he not, if he saw the planet in trouble, work towards more practical ways of pollution reduction ? This Govt. has taken the easy solution which, I’m afraid, is fraught with more trouble than its taxpayers prefer to invite.